The Blaze TV host Dana Loesch came up with the idea of a fundraiser for Memories Pizza, targeted for destruction because of their beliefs in support of traditional marriage. National talk radio hosts Glenn Beck and Rush Limbaugh picked up Dana's baton and ran with it. What struck me most about the initiative was the self-less unity. Conservatives of varying stripes came together to lift up a wounded brother (Memories Pizza) in the battle for liberty and freedom. In essence, conservatives across America said to Memories Pizza, "Hang in there bro, we got your back." Awesome! This is how we win this battle for our freedom folks. This is how we push them back. The fundraiser felt like a project of our national conservative family. I was excited about participating; eager to do my part. Mary does our on-line transactions. The moment she awoke, before she could pour her first cup of coffee, I asked her to go to the website and contribute. When she told me it was done, we felt great. But folks, what really warmed my heart is the fact that we did it together. United we stand, divided we fall sounds cliche. However, it is so true. Look at the power we have when we work together. Twenty years ago, I produced a similar feel good initiative. Working on a song in the recording studio late one night, a ten year old kid knocked on the door asking for money. Frank Starchak my music producer said the kid had bad parents and was on the road to becoming a juvenile delinquent. There is a verse in the Bible that says they meant it for evil, but God meant it for good. 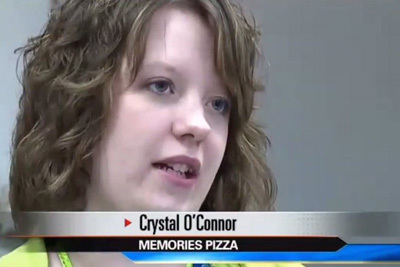 Clearly, the Left's attack on Memories Pizza was an evil attempt to destroy the Christian owned business. God used the Left's attack to bless not just Memories Pizza, but give a must needed shot of feel-good inspiration in the arm of the Tea Party movement. A patriot called a national talk radio show to say she and her husband plan to trek to Memories Pizza to celebrate their wedding anniversary. What a great idea. Brother and sister patriots, together, we did it! United we stand, divided we fall.